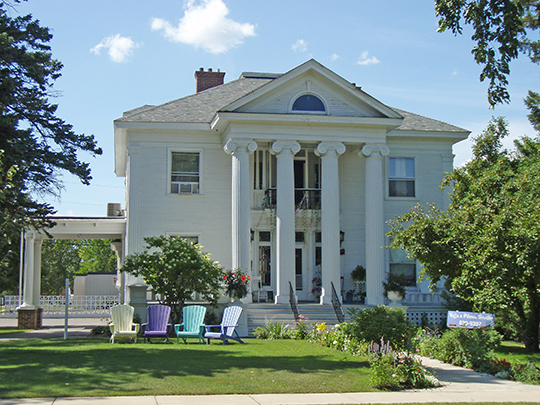 Brainerd City Hall is located at 501 Laurel Street, Brainerd MN 56401; phone: 218-828-2307. Photo: Werner Hemstead House, ca. 1903, 303 North 4th Street, Brainerd, MN. Listed on the National Register of Historic Places in 1980. Photographed by User:Elkman (own work), 2008, [cc-by-3.0 (creativecommons.org/licenses/by/3.0)], via Wikimedia Commons, accessed April, 2014. Incorporated in 1873, Brainerd industries (principally lumber and paper) thrived throughout the late 1800s and early 1900s. It borders the Mississippi River and is claimed to be the home of legendary Paul Bunyan. The city is located several miles north of the confluence of the Crow Wing and Mississippi Rivers. The name was given by Northern Pacific Railroad Company president, John Gregory Smith in honor of his daughter (Anne Eliza Brainerd Smith) and her father-in-law, Lawrence Brainerd.